Armstrong Steel has been selected by a Production Company in Texas to design, engineer, supply, manage dirt work, concrete and erect an Armstrong Steel pre-engineered metal building for a business owner in Pleasanton, Texas. The project consists of dirt work, concrete, erection and furnishing an Armstrong Steel Building. Dirt work is complete and concrete work has just commenced. This project is fully managed by Armstrong Steel’s Construction Services Division. DENVER –Armstrong Steel has been selected by a Production Company in Texas to design, engineer, supply, manage dirt work, concrete and erect an Armstrong Steel pre-engineered metal building for a business owner in Pleasanton, Texas. The project consists of dirt work, concrete, erection and furnishing an Armstrong Steel Building. Dirt work is complete and concrete work has just commenced. This project is fully managed by Armstrong Steel’s Construction Services Division. Armstrong Steel Buildings Construction Services Division schedules arranges for the completion of pre-engineered steel buildings and metal buildings systems to each client’s exact local building requirements and specifications. “Working with Les Lind, the client’s on site representative on this building project, has been a real pleasure. This particular customer, like many others, shopped around locally for dirt work, concrete, and erection services and simply couldn’t beat our pricing. It’s just another benefit to choosing Armstrong. If price isn’t an issue, choose a local outfit! If you’re looking for a company to cost effectively manage your project with unbeatable pricing, it’s obvious who everyone calls,” says Nick Martinez, General Manager of the Construction Services Division. Texas is an extremely competitive part of the country when it comes to pre-engineered metal buildings, concrete prices, and erection services. Armstrong Steel recognizes the demand for high quality products and still blows the competition out of the water. “When it comes to pre-engineered metal buildings, no one does it better. 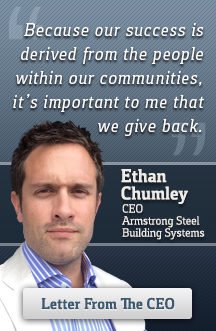 We’ve got the smartest folks in the industry working on your project and we’re the company contractors turn to everyday,” states Ethan Chumley, President of Armstrong Steel Buildings. As part of the project, the experts in the Construction Services Division recommended the building be erected on a different area of his property. This led to significant savings because the recommendation required less back fill, less excavating, and less labor and materials. "We looked for contractors locally to put up our Armstrong Steel Building and couldn't find fair pricing or dates set in stone. We decided to let Armstrong handle everything for us, they were competitively priced and got our job going immediately," says Les Lind. If you or someone you know needs space, call Armstrong, America's most trusted name in pre-engineered steel.